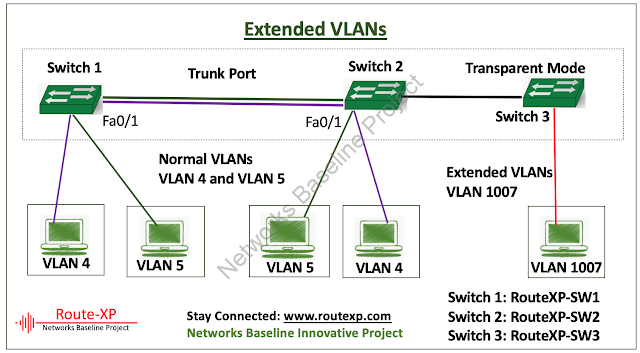 Make sure you know about extended VLANs, as VLAN IDs in the extended range are not saved in the VLAN database and are not recognized by VTP unless the switch is running VTP version 3. So, if you are using VTP v1 and VTP v2, a switch will be configured as VTP transparent mode when you create extended-range VLANs. If VTP mode is server or client, an error message is generated, and the extended-range VLAN is rejected. VTP version 3 supports extended VLANs in server and transparent modes. STP is enabled by default on extended-range VLANs, but we can disable it by using the no spanning-tree vlan vlan-id global configuration command. When the maximum number of spanning-tree instances are on the switch, spanning tree is disabled on any newly created VLANs. If the number of VLANs on the switch exceeds the maximum number of spanning-tree instances, we recommend that you configure the IEEE 802.1s Multiple STP (MSTP) on your switch to map multiple VLANs to a single spanning-tree instance.